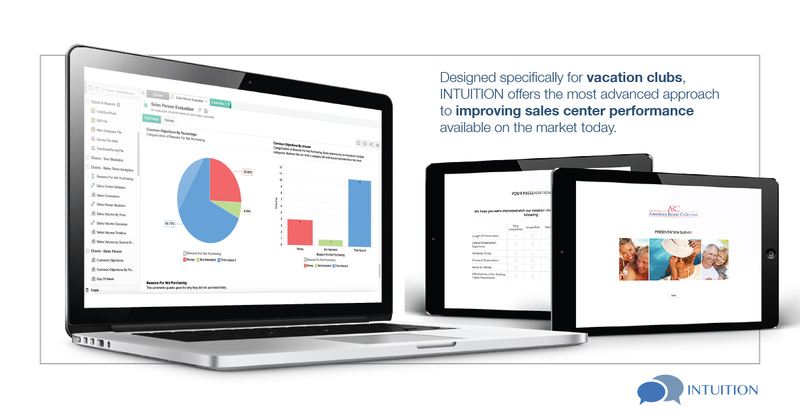 Designed specifically for vacation clubs, INTUITION offers the most advanced approach to improving sales center performance available on the market today. Improve closing percentages, VPGs and ultimately increase overall sales volume by understanding more about what’s happening in your sales centers; in real time using our unique tablet-based survey with superior, unrivaled analytics . The aptly named ESP Survey, acts as your sixth-sense to what’s happening on your sales floor by combining sales center statistics with customer opinion to provide powerful reporting that clearly defines areas for improvement at product, sales team and individual sales person levels. SAVE SALES – Be instantly alerted to unsatisfied guests before they can negatively impact other new members once leaving the sales center. RECOVER SALES – Identify potential lost sales through survey answers and get another shot at closing the sale before the guest’s vacation is over. INCREASE SALES – Based on the unique combination of sales statistics and customer feedback, know when individual sales people need additional training and exactly what training they need to improve their performance. TEAM MANAGEMENT – Track and compare multiple sales teams performance. Plus, receive automated reports daily, weekly and / or monthly – or simply login for near real-time statistics.